Python is the language of choice for controlling the Raspberry Pi’s GPIO pins. It seems only natural then that to interact with your Pi over the web it should run a web server able to handle Python CGI scripts. Following the steps below will get the lightweight nginx web server running on your Pi, handing Python requests off to a uwsgi helper process. Add a location to the /etc/nginx/sites-available/default to pass Python requests on to uwsgi. This needs to be placed inside the “server” block of the configuration, for example right after one of the existing “location” sections. 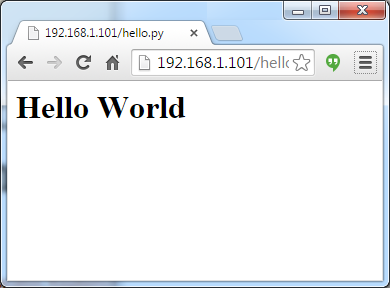 If you see the message “Hello World” then everything is working.